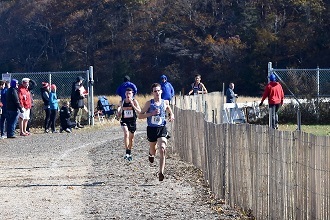 Nov. 14, 2018: It was a cold and very windy day at Sunken Meadow State Park on Saturday during the New York State Cross Country Championships. On one of the most challenging courses in the state, Matt Rizzo managed to hold on to a narrow lead to win the Class C State Championship. 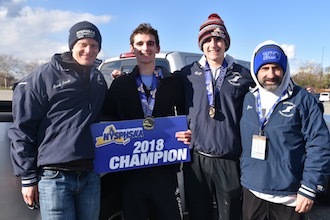 Despite the wet, muddy, and windy conditions, Matt won in a time of 16:22.2, bettering his time from the 2017 state championships by more than 40 seconds. Section 1 had a good showing with Croton's Sean Gardiner placing second in 16:25.2 and Bronxville's Alex Rizzo placing fourth in 16:42.1. Matt Rizzo approaching the finish at Sunken Meadow. Photo by C. Rizzo. 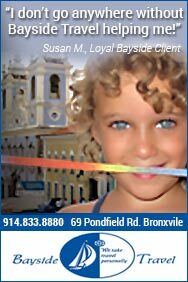 The Bronxville girls, always competitive in the Class C State Championship, took second place, finishing behind Section 2's Greenwich. Greenwich goes back and forth between Class C and Class D and was the state champ in Class D last year. All seven girls ran extremely well and all recorded personal records on this difficult course. Out of 130 participants, Natalie Weiner, who finished first for the Broncos, placed 28th in 20:49.50. Other Bronco finishes included Emma Mandanas in 32nd place (20:52.50), Patty Haggerty, 34th (20:58.4), Molly Palma, 44th (21:19.1), Avery Widen, 57th (21:35.7), Gigi Chrappa, 76th (22:03.5), and Anna Outcalt, 86th (22:19.1). The forty-five seconds that separated the top five Bronxville girls was the narrowest of any team in the meet. The indoor track and field season starts practicing this week, and the Section 1 kick-off meet will take place at The Armory on December 9. 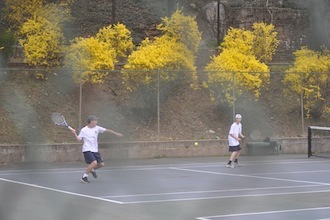 Pictured at top (L to R): Assistant coach Ian Clark, Matt Rizzo, Alex Rizzo, and Coach Jim Agnello.